In 1828 Missionary Rev. Simon Petit Lalumiere of the Old Cathedral in Vincennes celebrated the first Mass in Barr Township, Daviess County, Indiana, in the home of Ignatius Spalding. For the next five years fhe continued saying Masses in this house which was located about one and one half miles from the current site of St. Mary's Church. A log building was contructed on three acres of land purchased from the Norris family and on November 25, 1834, Bishop Simon Brute dedicated and named it St. Mary's Catholic Church. Father Lalumiere was named it's first pastor. St. Mary's was the second Catholic Church built in Daviess County, and the third in Indiana. Members of this new congregation were from Bogard, VanBuren and Barr Township in Daviess County and many from Martin County. In 1836 Fr. Maurice de St. Paulis was assigned as first resident pastor and, finding the church too small, had a second larger log church built. Both churches were constructed near the site of where the community church hall now stands. In 1837, Bishop Brute purchased two additional tracts of land totaling 160 acres. This land was directly across the road from the original church site. Father Le Franc was resident pastor from 1839 to 1844 and during this period he was responsible for overseeing the construction of the third church building. This church was build of bricks, many of which Father Le Franc personally made on site. Later, in 1858, 140 acres were sold, leaving approximately 23 acres as church property. Early St. Mary's was the mother parish for seven other missions: Mt. Pleasant, Bloomfield, Scotland, Miles Settlement, Bedford, Bloomington and Shoals. Under the direction of pastors, Rev. Gustav Michael Gennsz, who served from 1875 to 1879, and Rev. Timothy O'Donahue, serving from 1879 to 1890, a new church and rectory was build. The church was a beautiful large brick building, built around the existing church, and being 110 feet long and 55 feet wide and 110 feet high, with a 9 X 5 foot gold leaf cross, and had a membership of 600 parishioners. This church completely burned to the ground on December 27, 1925. Only the baptismal font was saved and is now housed in the current church. After the fire, a temporary church was ordered from Sears & Roebuck and was placed just South of the burned church. 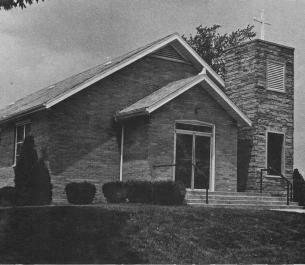 This building has been added on to and remodeled several times and is now the existing Chapel at St. Mary's today. A community hall was built in 1954 near the site of the original log buildings. In 1984 St. Mary's celebrated it's 150th anniversary. Over the years, from it's beginning in 1828, St. Mary's has been blessed with many great and caring pastors who ministered to the parishioners. From it's congregation, St. Mary's has also been blessed by having eight men to be ordained priests and thirty girls who became nuns. From the Civil War until the present time, over 90 boys and girls from St. Mary's have served our country to preserve the peace. 19 Civil War veterans are buried in the church cemetery. After nearly 170 years of service to the Catholic community, Bishop Gerald Gettlefinger closed St. Mary's Church on November 23, 1997 and made it a Chapel. The Chapel is currently used only for funerals, weddings and a few other special occasions. Through this extinctive union we are moving forward with a larger, more vibrant, and refreshed Catholic Church family in Martin County!